Construction fencing has been installed around the Donohoe Building at 400 6th Street, the former home of the District's Child and Family Services Agency. Their lease ended last year and now demolition is underway at the office building, which was purchased by Trammell Crow and the AFL-CIO Building Investment for $41.9 million in 2012. 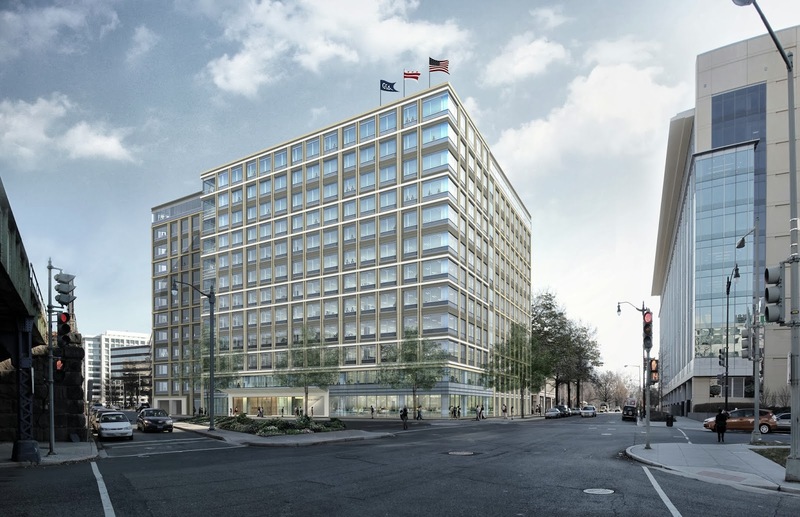 Once demolition is complete, construction will begin on a speculative 12-story office building designed by Gensler with 342,000 rentable square feet. There is space on the ground level for retail if demand supports it. 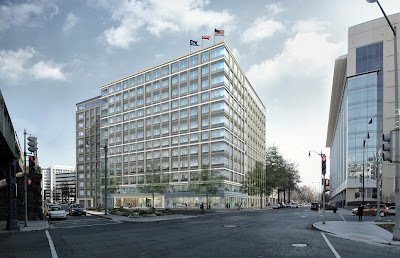 The new office building is located less than one block from the D Street entrance to the L'Enfant Plaza Metro station. From the look of the above rendering, they are looking for a GSA tenant. Next door to the site is Constitution Center, which has its share of GSA tenants. Perhaps the office market in general (and GSA's appetite for leasing new space) will be improved by the end of 2015 when this building is scheduled to deliver. Construction fencing went up this week.